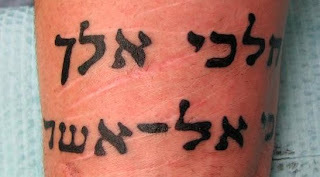 Bad Hebrew Tattoos: Biblical Switcheroo - Never a Good Idea! Biblical Switcheroo - Never a Good Idea! Today we have a guy with issues. He apparently wanted the following tattooed in Hebrew: "Where I Go, Ye Shall Follow". Possessive much? I think so. When translated from Hebrew to English, it goes along the lines of "You Go, I Go, Because to Where". Apparently our Tarzan decided to base his tattoo on a famous biblical verse, Ruth 1:16, where in a touching moment Ruth tells her mother in law Naomi: "For where you go, I will go". This guy though, he wanted to modify Ruth's plee to suit his needs, and he had the right idea too - the verse should be reshuffled. Good idea, bad execution. The sharp eyed can see that our victim simply switched places the two parts of this sentence for his tattoo. It's never a good idea to pull something like that without some basic knowledge of Hebrew. You can never assume that the structure of a Hebrew sentence will be magically similar to its English equivalent. Before we wrap it up, I just have to add that in both cases we speak of non gender specific "I Go" and of a female "You Go". If you're thinking of some other configuration for your tattoo, don't use this! And he goes, "You go. ", 'n she's like, "Wherevah.."
Heh, I like it. A valley guy from ancient times. I think he meant to write "Where ever you go I shall follow", which is nicer than the other meaning. I also think he used a computer for printing the font for the tattoo artist. When a computer without proper RTL support tries to wrap a hebrew line of text, if you click ENTER in the middle of the sentance, the BEGINNING of the sentance will drop to the next line, not the end. Which might explain the lines-switch. I also think like the previous commenter that he didn't mean to change the sentence. He just either copied it from somewhere and broke the line incorrecty himself, or it happend by some application without good hebrew support. Used to happen alot to websites written in visual hebrew. Can u tell me how is the translation of Ruth 1:16 in non-gender to male form(non-gender specific "i go" and male gender "you go")?i would want to tattoo this verse and i want to refer to a boy because i am a girl:D i would also like to add the nikkuad too at the translation. If you're set on Nikkud, I suggest you go to http://www.hebrew-tattoo.com/, they can help you with the Nikkud and font selection. Can someone help me -- the dash that appears in the first line, is that necessary? I've seen this phrase written without the dash. @Anonymous - the dash just means the two words are linked together. It isn't mandatory, and some versions of the verse don't have it. In this case, the two words together translate as "where".